Most dinosaur fans would agree that theropods are among the best characterized of dinosaurs. From agile speedsters like Velociraptor to lumbering powerhouses like Tyrannosaurus, these bipedal beasts appear to the public as ideal killing machines, with jaws full of sharp teeth and the legwork to keep up with their prey. However, recent studies of maniraptorans, the theropod group that included both dromaeosaurs like Velociraptor and modern birds, have revealed a variety of odd theropods that seem to have abandoned the predatory way of life. Therizinosaurs, a group of pot-bellied, long-necked theropods, possessed leaf-shaped teeth and slightly curved claws. Since none of these features appear useful for predation, popular hypotheses suggest ground sloth-like herbivory for these animals. Oviraptors add to the puzzle with sharp, recurved claws at the end of powerful forelimbs and robustly built, yet toothless, beaks. 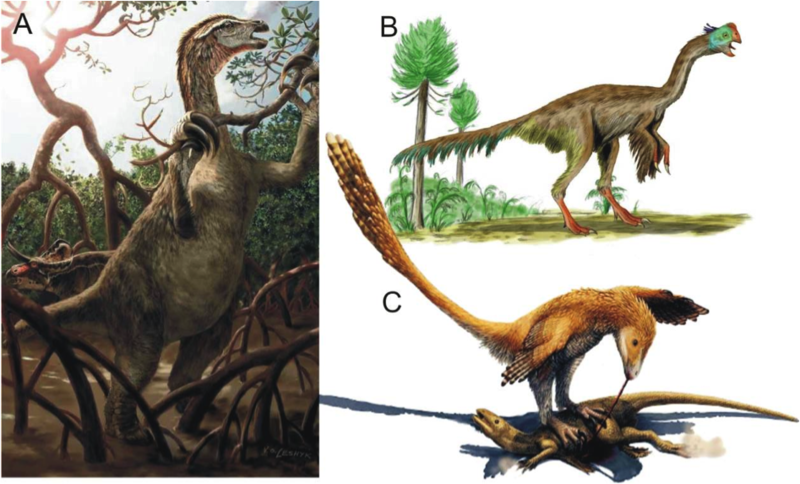 This mishmash of seeming carnivorous and herbivorous traits has led to hypotheses of oviraptor diets ranging from leaves, fruits, shellfish, nuts, and even the eggs of other dinosaurs. This entry was posted in academia and tagged carnivore, Casey Holliday, dinosaurs, dromaeosaur, Henry Tsai, herbivore, HollidayLab, lizards, maniraptor, omnivore, oviraptor, raptors, reptiles, research, science, theropods, tyrannosaurus, vegetarian, velociraptor. Bookmark the permalink.